Conveniently located 33 km / 21 miles north-west of Trieste and 110 km / 69 miles east of Venice, Trieste Friuli Venezia Giulia Airport (Aeroporto Friuli-Venezia Giulia) is a modern and increasingly popular transport hub, serving over 700,000 passengers a year. Situated close to the borders with Slovenia and Croatia, Trieste Airport (TRS) is also close to Begliano, Cassegliano, Redipuglia, Ronchi dei Legionari, San Pier d'Isonzo and Turriaco. Often going by the name of the Ronchi dei Legionari Airport, Trieste has become the main gateway into Italy's Friuli-Venezia Guilia region. Its single terminal handles all international and domestic flights, including a number of budget services, such as a Ryanair route to London. Friuli Venezia Giulia Airport is easily accessible by road, as it is sited a mere 1 km / 0.5 miles from the main Trieste to Venice motorway, being extremely well signposted along the way. Shuttle buses provide transport to the city of Trieste as well as to other destinations in the area. Shuttle buses and trains also provide connections to the main train station, with it situated some 5 km / 3 miles from Trieste Airport. Taxis pick up from outside the Arrivals Hall from 08:00 to midnight and can be chartered to the city or beyond. The town of Monfalcone is sited to the south-east of Friuli Venezia Giulia Airport and is an important regional centre of industry, known for its shipbuilding and engineering industries. 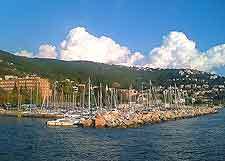 Located close to the border with Slovenia and on the north-eastern side of Italy, the port city of Trieste is known as the 'Pearl of the Adriatic'. The old city has many buildings with historical and architectural significance, with the Victory Lighthouse and the San Giusto Cathedral being two that are well worth a visit. Friuli Venezia Giulia Airport (TRS) is also a gateway to two record attractions, the Grotto Gigante - the biggest tourist cave in the world, and Piazza Unita d'Italia - Europe's largest piazza. Other highlights in Trieste include the Colle Di San Giusto hill, which offers breathtaking sea and city views, and is also home to a 15th-century castle and a nearby Roman theatre.